Gabrielle moved to the Florida Keys in 2012 where she was quickly inspired by the beautiful flora and fauna. She enjoys painting the unique plants that are found throughout the Keys, but also the quaint houses of Key West and various other scenic views one can’t help but be drawn to. Painting in acrylic, she also works in mixed media and explores the textures and effects one can achieve when combining mediums. Her new work has been inspired by her yoga practice and the journey to discovering the self. 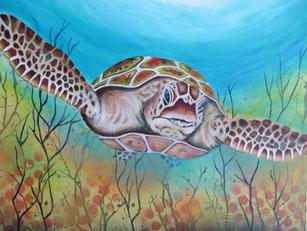 Gabrielle’s work has been shown in Key West, Big Pine Key and Marathon. In 2015 she was the proud recipient of an Anne McKee Foundation’s grant and took first place in the Lower Keys Artist Network's judged show. She is a member of the Lower Keys Artist Network as well as The Studios of Key West and has her work on permanent display in the Artists in Paradise Gallery in Big Pine Key and Shady Palms Gallery in Marathon as well as Frangipani Gallery and the Key West Art Center in Key West. All images are available in prints or notecards. Please contact us for more information.